There are many proverbs in Greece and many are related to food. For example there is one that says “Love goes first through the stomach”. It seems our ancestors new something indeed. While many people outside of Greece have heard a lot about roasted octopus, souvlaki and the Greek salad, they will savor some delicacies only when they will come to Greece and get initiated by locals. Along these those who want to go deeper into some of the ancient secrets of love potions (aka, aphrodisiacs) will find quite some intriguing information. So, here are 10 things about the stomach and another 7 for the love part! 10 Strange Greek Foods for the Visitor of Greece. 1. Snails (Kohli “Bourbouristi”). Snails fried with their shell that make a popping sound when cooked. Is considered a delicacy especially in Crete. 2. Splinantero. A weird looking kind of sausage. Normally, it is made from the heart and spleen of lamb, both minced and staffed in the large intestine taken from a big male goat. 3. Patsas. This is the belly of the lamb chopped in small pieces. Varies from think to thick chopped pieces. It is a soup and is considered a great food after drinking lots of alcohol. The ultimate hangover reliever. 4. Sea urchin Salad. Either in a salad or raw with a twist of lemon, directly eaten as ripped from the sea. 5. Lamb’s head. Will you be in Greece through Easter time? Lot’s of lambs are roasted everywhere and chances are that if you are a guest Greeks will honor you with offering this to eat, eyeballs, brains and all. 6. Octopus fried ink sack. No, not the octopus. Just the ink sack is removed and then deep fried. Usually met at Kalymnos. 7. Marinated Gavros. Very small fish cooked in salt and served with a bit of oil as a food snack (“meze”). 8. Kokoretsi/Kontosouvli. Both are also prepared for Easter day (Sunday) and the first is made with leaver and fat, along with herbs all through a roasting spit and wrapped with the intestines. Kontosouvli on the other hand is like having lamb chops also through a roasting spit. 9. Kaltsounia sweet. Usually met in Crete. Is made with a star shaped dough, white cheese (myzithra), with some honey and cinnamon. 10. Karidaki Sweet. It is made from a whole walnut which is prepared for many days along with its shell to become very soft. It is eaten like that. 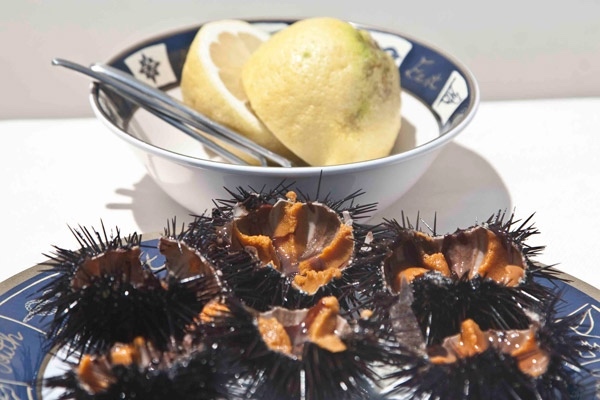 Want to know about aphrodisiacs? Visit the blog post and read all about it!